The framework / server has gained a lot of popularity in recent couple of years, and today we see large corporations and companies like Yahoo!, PayPal, Microsoft, and LinkedIn all using Node.js to power some parts of their infrastructure and software requirements; the one area Node.js excels the most at is the ability to serve unlimited range of data quickly, without compromising the performance of each request. Dan Shaw published an interesting slideshow on SpeakerDeck about the Node.js usage increase in the Enterprise market, and how exactly different enterprises are using Node to optimize their software experience — some of which we mentioned above are also talked about in the slideshow. Users have officially downloaded Node.js more than 90,000,000+ times, at the average rate of 250,000+ new downloads every day. That’s a staggering number of downloads for any platform or library, but clearly Node has dominated the hearts and minds of the developer and engineer communities — Node.js can be applied to more than just web apps, but also robots, drones, and other cool stuff! The Chinese engineer and developer communities have strongly started to adopt Node.js as their primary framework for building high-end tech concepts and converting ideas into material form. Rod Vagg has a little more to say about these statistics and their primary source — Node.js had a huge growth in 2015, we are already eager to see stats for the next year! Things are moving fast, and if you’re just starting out with Node.js — begin by observing this insightful code-guide from the folks at RisingStack; the insightful guide provides a look at how to operate Node.js infrastructure, how to approach everyday development needs, amongst other insightful tips and tricks to make you a better Node dev! Keeping up with the same idea, StrongLoop — just a week ago — published a code optimization guide for Node devs, check that one out too! (Here’s a much quicker optimization guide, both worth investigating!) And last but not least, a look at how much Node.js can change and improve a company in just 365 days time (one year) by Scott Hammond from Joyent. Express.js has been on a little bit of a rollercoaster these past couple of months, a lot of community members are beginning to wonder what is going on with the late submissions of new framework releases, but really what’s happening is that the Express dev team are using NPM to push out new modules, rather than commit constant framework changes within the core of the framework itself. There is also a HUGE discussion happening on GitHub right now — Express users wondering whether the framework is slowly beginning to decay. Then we have those Express users who worry less about the future of the framework, but more about the things that it is able to do for them right in this moment, Nikolay Nemshilov takes a look at Express.js usage for apps in the modern development age. What is Express.js anyway? It’s a small and robust Node.js web development framework for helping developers build mobile and desktop applications at a much faster pace, with a lot of integrated features for making speed and scalability a number one priority. Because Express is lightweight, it goes really well with the hundreds of thousands of free modules available from the NPM public module database. On top of those, Express also has a great API and intentional performance quirks to guarantee the best performance without compromising Node.js functions. Hapi is a full-stack development framework rich in features and functionality to help developers build reliable software and applications without the compromise of weak frameworks. Instead of having you build infrastructure within your application modules, Hapi allows you to create reusable app logic patterns that help to increase productivity and overall workflow. Jowanza Joseph was a loyal Express.js user until he began to experiment with Hapi and all that it had to offer to him, a highly recommended read. Nearly 200,000+ downloads last month alone, and the framework is constantly being updated with the help of community and its recommendations, and speaking of Hapi’s community, the best way to learn more about Hapi’s features and usability in different situations, make a cup of coffee and head over to the community section to learn about all the reviews and feedback from leading companies like Mozilla, NPM, Walmart and many others — all of whom have benefited from Hapi in one way or the other. Flatiron’s a full-stack framework for enabling developers to push out desktop and mobile apps with reusable components. Some of the main features of the framework include the ability to direct website traffic based on the URL’s that the server and browser is dealing with, an in-built templating system that will be pleasant to use and work with, a storage agnostic resource-oriented object to document mapper for building data models with validation and sanitization, a plugins management platform for helping you to extend your applications with detachable plugins and components, and there is also a fully integrated library for managing all your application logging needs. The project hasn’t been updated for a little while (but it’s fully stable), but we also recommend to check the actual Flatiron GitHub profile and experience a number of inspiring Node.js projects loved by hundreds of thousands of developers and software engineers. Locomotive has been named as one of the most powerful Node.js frameworks because of its support for MVC patterns, RESTful routes, and it also happens to work flawlessly with Express (built on top of it), so you’re getting two for the price of one. Locomotives seamless integration with other databases and templating platforms is what keeps developers coming back to this extensive framework. You won’t find a more easy to work with framework than this. Total.js is perhaps one of the most forgotten Node.js server frameworks out there, but clearly for no apparent reason as Total is a great and rich framework that provides great unique features for developers who wish to build rich applications and software. The full-stack framework gives developers tools like a functioning web server, a unique views engine for building modules, an SMTP manager, localization tools, tools for processing visual content like images, websockets, isomorphic codebase and much more. It isn’t limited to any given database, and for those who are dead serious about trying Total.js — there’s more than 100+ unique code examples available for free download, a weekend of coding to be had. The same team developing the amazing Express.js framework are also the same guys who are working on Koa.js — a futuristic next-generation web development framework for Node.js that wishes to be a more concise and expressing version of Express to help develop web apps and API’s. Koa’s main feature is Generators, a nifty little way of avoiding the use of callbacks and helping developers to better handle errors. Edward Bramanti wrote a really good article for getting started with the framework and how he felt the journey unfolded for him, this article could be a good starting point for anyone interested in trying to work with Koa.js on a real project. Middleware is available for those who wish to build more rich web and mobile apps. Then we have a really technical article from the guys at 60Devs — discussing the possibilities of rapid server development with the Koa.js framework. And for anyone who is working with Google Business and Google Developers — you can easily run Koa.js in your server instances. Diet.js is a very tiny modular Node.js framework for building fast and scalable APIs and applications. Use the host controller to control multiple hosts, use the router to build clean APIs and URLs right off the bat, integration of Node.js request and response objects, middleware allows to expand your apps and APIs with modules, very lightweight for maximum result, and of course it is fully open-source allowing you to become a contributor whenever you like. Compound.js took its time to shine, but these days it’s one of the most reliable MVC frameworks that enable developers to build applications on the fly in just minutes from starting to learn about the framework. Thanks to a supportive community and extensive documentation library, Compound enables developers new and old to build scalable apps as they progress with the learning curve. Compound has found a lot of love between Ruby on Rails developers as this framework provides similar logical expressions and ways of thinking, there are also a ton of tutorials on how to build full-fledged Compound.js applications, and also RESTful APIs for those who need just a quick API solution. Amazon AWS also provides a Node.js + Compound.js integration for those interested. Geddy’s a full-stack Node.js framework based on the MVC structure that’s fully open-source. It has been built on top of Rails ideology to provide things like authentication modules, Passport.js and SocketIO integrations, which then provides a very flexible environment for building secure apps within just a few lines of code. Geddy’s biggest feature is Commands, a way to generate different comments for automating much of the coding workflow, like building models, views and controllers, and even mundane tasks like doing authentication for the SocketIO integration. With Geddy you can transfer all your focus towards the heart of the application you are building, and Geddy will do the rest. Geddy works with a number of popular templates (EJS is default), and to specify your own you just have to edit the project’s config file. Adron Hall has shared his opinion on three different Node.js frameworks; Geddy, Hapi and Restify, so take a closer look at this views of the strengths and weaknesses that each framework carries, and also to learn more about the inner workings of the Geddy framework. Those developers and engineers working with the Google Cloud Platform — get excited, as Geddy is fully supported by the platform and you can easily run your own Geddy instance in seconds! Sails.js is a very well-known name in the Node.js framework community. This enterprise-level framework will allow anyone of any experience level to build their own custom apps. The framework takes inspiration for its architecture from other frameworks, the likes of Ruby on Rails (as have many others in our list), but with the creative drive to provide a more data-focused experience for modern app development. Sails is very popular amongst applications that need real-time functionality that Chat-style applications use. Last year Mike McNeil (the founder of Sails) released a free online course for learning how to build real-time apps with Node.js, Sails.js and Socket.io — a truly eye-opening course that will set your Sails.js journey on a stable foundation for future development. Contrary to that, there have been some rumours about the stagnation of Sails development, but that was also cleared up by the founder himself in a very concise GitHub reply to whole community — check it out here. If you’re looking for a more simplistic approach to deploying a Sails app, take a peek at this tutorial from Felix Rieseberg. Also look out for the Sails.js in Action book that’s going to be released in March 2016 — this will for sure propel the framework into a completely new and exciting direction. The developers used the Express.js framework as the main core of Rhapsody.js. Rhapsody can help developers to create RESTful APIs for models. Its framework can sustain sockets and allow middleware. It can also provide unique features that you can only experience in real-time coding environment. As encouraged by the framework developers themselves, the best way to learn about something is to give it a try. Works with all databases. 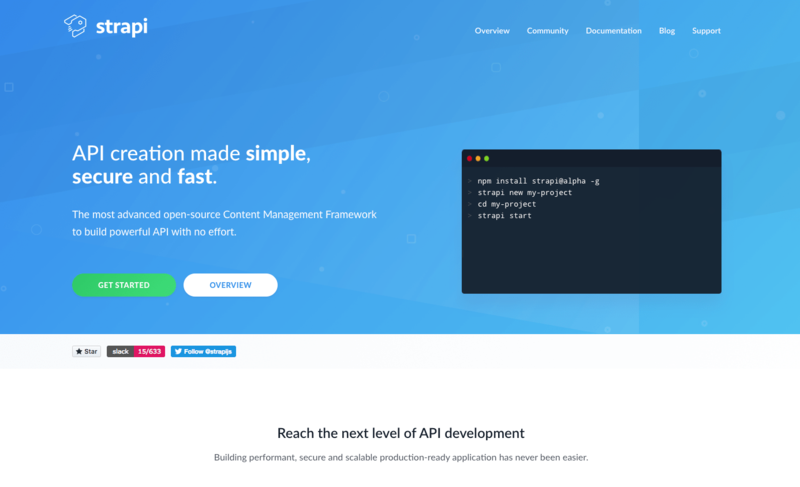 Strapi.js helps developers to build rich applications and services through a fully open-sourced Node.js framework solution. Instead of focusing on the application infrastructure, Strapi can help you on building app logic that can be reused. The framework is most famous amongst those developers and software architects who are looking to build production-level apps fast. It’s more efficient rather than spending weeks of structuring and projecting. It’s database agnostic, meaning that you will have zero problems with working with alien databases. Strapi supports the major front-end frameworks and will even help you generate automated RESTful APIs for them. Security is huge at Strapi. That’s why Strapi comes with several security layers that just work depending on your needs and ships reusable security policies. Derby.js is a full-stack MVC framework built for establishing a more solid routine towards creating modern web applications. You can achieve all of this without the need to write complicated code. With Derby you can easily build real-time applications that will run simultaneously in the Node.js server and the browser. Derby enables the Racer Engine for developers to use. It’s a powerful way of synchronizing your browser, server and database data in real-time amongst all three mediums. It also enables you and your app users have a true real-time experience. Racer supports offline usage and conflict resolution out of the box, which greatly simplifies writing multi-user applications. Derby is proud to promote that the apps built with the framework are fully compliant with search engine requirements. Derby can also index your apps as normal websites. This gives you the chance to experience the free and organic marketing potential. Derby is well-known for allowing developers to do offline modifications, on top of building rapidly fast app structures. Anyone eager to learn more about Derby.js should head over to the official Resources page and get a little more insight in the availability of communities and learning resources. SocketStream is a known open-source Node.js framework that’s used mostly for constructing one-page (or single-page) real-time apps. In turn, SocketStream gives developers all the right tools for accomplishing the task. The modular setting is created in a way that it does not force you to depend on a set library or module that’s being used within the apps you are building, and the native integration of WebSockets really makes a difference for building fast and scalable real-time apps. SocketStream supports all modern cross-browsers, which enables for a smooth application experience amongst all browsers simultaneously. SocketStream reloads pages whenever modification of client-side files happen. This is one of its biggest upsides. There’s also a ton of documentation for client-side templates and an easy authentication method. Moreover, it has an easy technique for sharing code between the server and the client or vice-versa. MEAN should by now already be a household name. It stands for MongoDB, Express.js, Angular.js and Node.js. The first letter of each framework creates the word MEAN. What a mean combination of frameworks and technologies it is. A lot of front-end developers are looking for the perfect full-stack framework solution for your development requirements. If you are one of them, then this is the stack you will want to consider the most. It has humongous community behind each of these technologies. Also, MEAN itself has attracted quite the crowd for its simplistic approach to front-end web development. Searching for ‘MEAN stack’ on your favorite search engine is going to yield a plethora of great results. You can find results even for the last year alone. 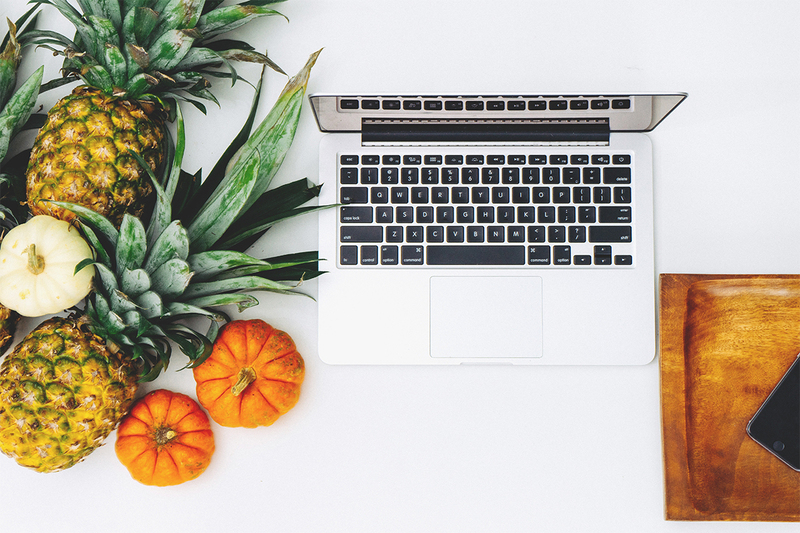 Some of our favorites so far have been an introduction course to MongoDB through the use of this stack, which has been hosted with the prestigous edX platform, created by Valeri Karpov and offered for free with an estimated 10 hours of course time. Then we have Aldo Ziflaj sharing a very insightful article on how the MEAN stack works and what are its most promising aspects for modern web development, and for those ready to dive deeper into the experience, check out this guide on how to begin building a Google Maps app using MEAN stack. Isomorphic means that you are using the same code foundation to run from the client and the server-side environment. Catberry is one such framework that focuses strictly on isomorphic development. It’s gaining traction amongst those who wish to pursue their expertise in this field. Forget about having to write code multiple times. With Catberry, you only have to write it once and you can use it in any way. Awesomely, you can use it in any way that best suits your requirements for each individual project. Catberry supports some of the most popular templating engines, including Jade, Dust and Handlebars. The framework will automatically assign a Single Page Application for you as well. To learn more, please refer to the official documentation. Seneca is somewhat unique to our list of Node.js framework, it’s actually a toolkit that acts like a framework. It can give you access to plugins that can help you maintain the foundation of the apps you are creating. And such functionality helps you to steer the focus on more important aspects of the app. Seneca will take care of things like databases, components and dependencies. All you have to do is to write code and see how the project goes from zero to one hundred. Seneca supports commands. It can call the appropriate command to help you execute tasks. Seneca can do this automatically whenever your app encounters a matching property. Intel, CoderDojo, GSD and others are amongst the few companies that reap the benefits of Seneca features. 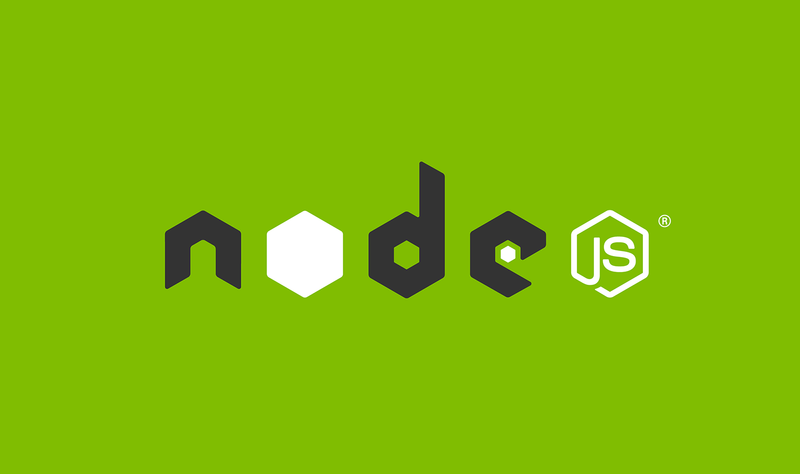 Node.js is a big platform for when it comes to API servers. ActionHero is one of the most well-known API frameworks out there. It can help you build fast, scalable and reusable Node.js API servers for your app projects. ActionHero acts as a toolkit for building API servers that will work together with your existing apps and platforms. 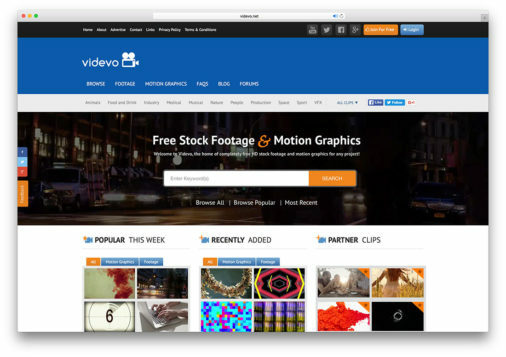 This platform has tens of thousands of users. They can help you locate the right answers and insights towards making the most of ActionHero in your everyday workflow. We are arriving at a part of our Node.js framework roundup where we will be focusing a little on frameworks. Frameworks which support API integrations, the the LoopBack framework from StrongLoop is one such framework. LoopBack is a mature framework that makes it easy to implement API design best practices that conform to popular specifications. It works with Mongo, SQL, and Oracle integrations for easy database management. There are also hundreds of NPM modules available that will help you to extend the default functions of LoopBack. The creators integrated it with Express (StrongLoop’s main product), made it open-source, and added hardened security functions. It also provides a fully accomplished API solution for any situation imaginable. 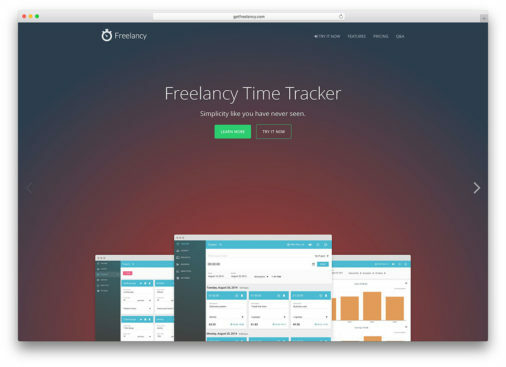 Frisby is fun and interactive Node.js framework for helping you to test API endpoints. It’s a more technical and specific framework, but certainly deserves a mention in our list. As we haven’t had much experience with Frisby, we are looking for some community feedback on its other uses. We are also searching on how to best integrate this framework in an extisting front-end (and back-end) development stack. 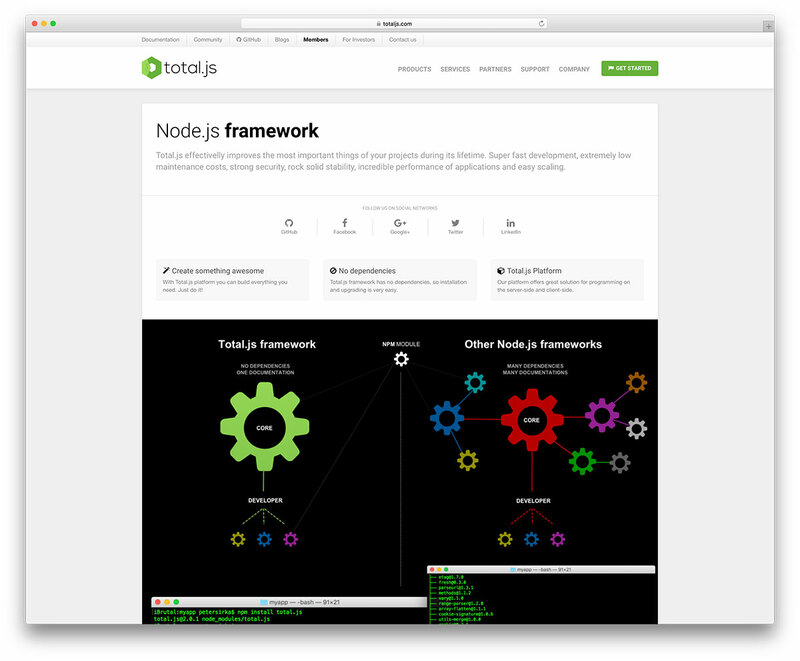 The developers specifically built this Web Server for Node.js Developers. 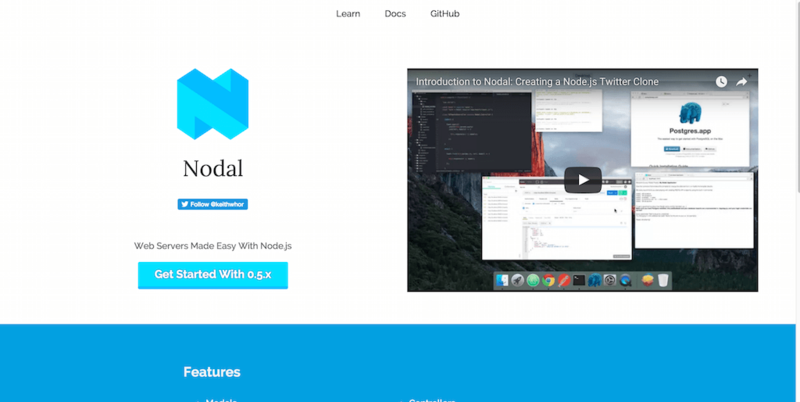 The main focus behind Nodal is to help developers create and deploy with ease. This opinionated full-stack framework lets you ease into the process of making tough decisions. Instead, it gives you the space to build sustainable products in a much shorter amount of time than usually expected. Those using Heroku can deploy their Nodal server in a matter of a few clicks. The framework is really new, but has already received a lot of support from veterans who have used frameworks like Django, one of the main things emphasized about Nodal.js is that it allows for smooth ES6 development, without having to feel like it’s forced or imposed within the core structure. Keith Horwood wrote a really cool piece on how to get started with deploying Nodal based servers and what else to expect from this framework, and then we have a nice introductory video (13 minutes long) about building a Twitter platform clone using pure Node.js. For those who are finding the Nodal framework uninspiring, check out this Hacker News article promoting the frameworks launch, and how hundreds of developers responded to it, we must say that majority of comments are very positive and insightful. Noodle isn’t necessarily a framework, but still functions like one. This Node.js server is a module for scraping data from things like web documents. Also, you can use cross-domain document queries to fetch data from files. 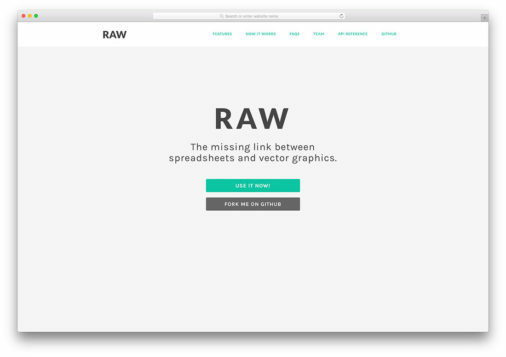 This can range from the likes of HTML, XML, Atom, RSS, and JSON. You can query using JSON POST, or JSONP — with the ability to do a multitude of queries at once. You can even POST to your documents if necessary, and there’s memory caching for both results and queries. 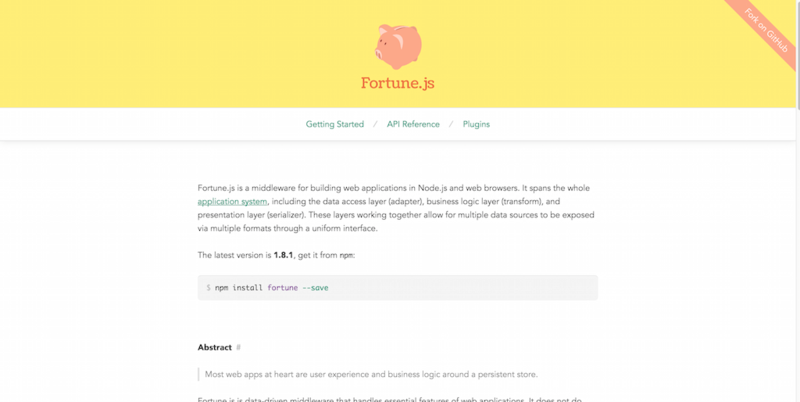 Fortune is a simple app middleware for browser, and Node.js itself. You can also use it to display the source of data (in variety of formats) through a simple uniform interface. Moreover, Fortune supports WebSockets. Also, the developers integrated the browser build with IndexedDB. Something that a lot of developers have been seeking for a long time. Did you tested one of the best fullstack node.js framework today? People are abandoning Meteor for much better alternatives, like Adonis.js that models itself on the popular Laravel architecture or Sails.js. I discovered Strapi and I love it! This is not only a framework, this is more than that!